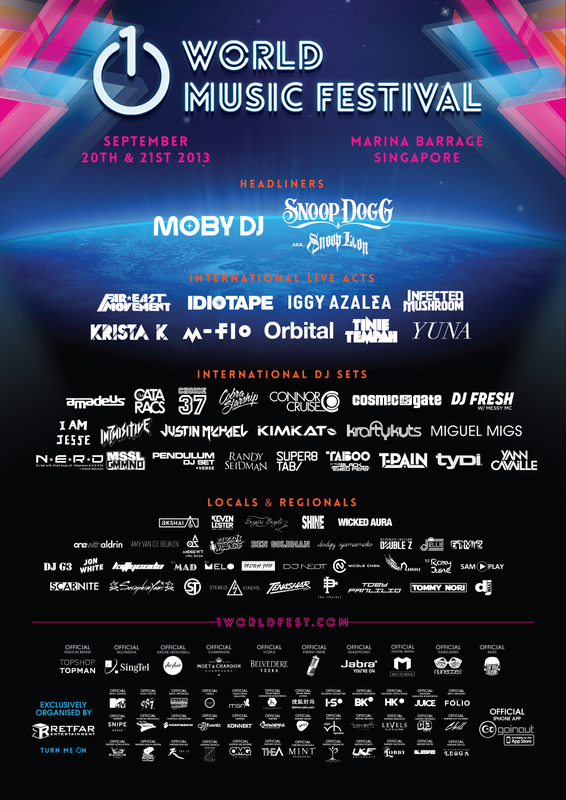 One of the bright events Ana Shell Media Press is excited to attend is the 1 World Music Festival at the Marina Barrage. Scheduled for September 20th and 21st (Formula One race weekend), the festival showcases international celebrity talents as well as some local and regional acts. Australian artiste Iggy Azalea is set to headline a seriously deep festival lineup that includes Snoop Dogg, Moby, T-Pain, Tinie Tempah, Far East Movement, Orbital, Infected Mushroom, Kim Kat, Miguel Migs, Amadeus, The Cataracs, Randy Seidman, Sub Focus + ID, Pendulum + Verse and Cosmic Gate, Cobra Starship, and many more! Local and regional acts include Inquizitive, Kevin Lester, Nicole Chen, Amy van de Beuken, Bangkok Invaders, Aldrin, Dodgy Yamamoto, Akshai Sarin, Shine5, Sezairi Sezali, Roxy June, DJ Benz, Stereo Vixens, Tenashar, Mera Jin, Jon White, MadebyTommy and Andrew T.
The 1 World Music Festival’s motto is “Turn Me On.” Turn me onto new music. New artists. New ideas. New forms of entertainment. They’re pushing the envelope in the music industry. Luckily, Ana Shell will be there first hand to experience all the sights and smells that truly make the difference between reporting the news and engaging an audience in it. Beberapa Tips untuk Menghemat Energi!